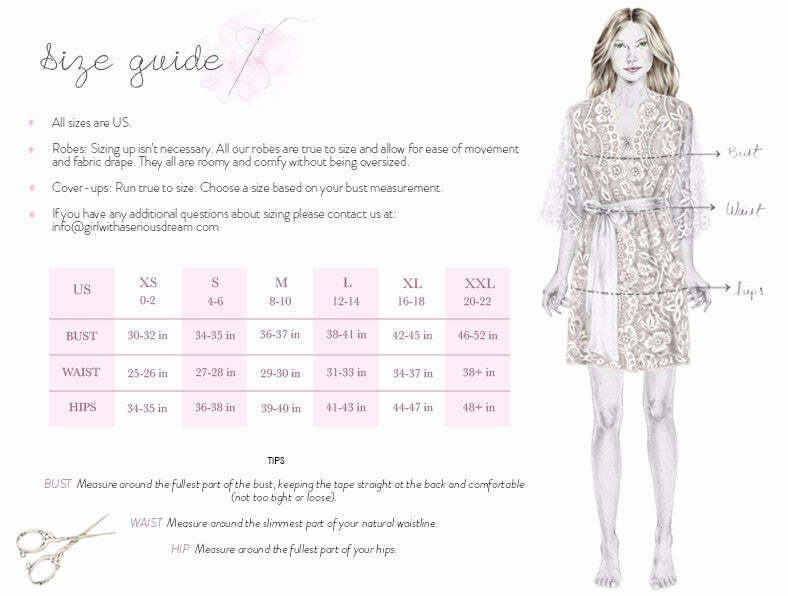 The Elizabeth lace robe is cut from soft cotton lace to give your getting ready look a natural, effortless feel. Gorgeous scalloped lace with floral eyelash trims goes along the neckline and the sleeves. This semi-sheer lace robe wraps around your body and has a lightly gathered hi-low back for a playful and flattering look. Comes with an attached self-tie grosgrain belt to define the waist. It's perfect for getting ready photos and it can be worn after the wedding day as an everyday loungewear robe or as a honeymoon cover up. Gorgeous for boudoir and maternity shoots as well. XS/S: up to 36 inches bust. M/L: up to 39 inches bust. Pictured in: Black. Floral motifs make this robe semi-sheer.